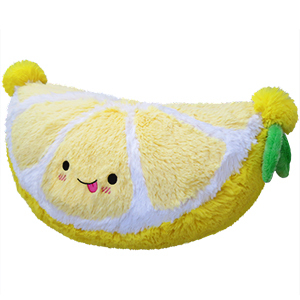 Comfort Food Lemon: An Adorable Fuzzy Plush to Snurfle and Squeeze! When life gives you lemons, do whatever the flippin' heck you want! After all, lemonade isn't everyone's cup of tea (in fact, many people prefer the cup of tea!). There are any number of citrus-based uses for that big yellow oblong fruit thing life just gave you. Make lemon poppyseed muffins! Pickle them for chutney! Peel them for an artful garnish! There are lots of places to use an unexpected lemon! It's perfect. In the time you've been reading reviews you could have ordered it already. I hug it while drinking my lemon water and its the perfect size and shape for hugging. Cuddle them. This squishable is the perfect shape to cuddle. The little leaves are so darn cute and its super soft. I sleep with this one regularly. I also got my dear citrus friend during squishy darts and was thrilled because I wanted to have the Squishables lemon for quite some time. Larry the Lemon is a true statement of survival because he was stuck in Houston for like 2 weeks because of Hurricane Harvey. But when he came to the house he was lemony fresh and so adorable.